“I call them the Magnificent Seven,” said Welsh, praising their backgrounds and attitudes. "The selection process for deputy sheriffs is very competitive. These men were exceptional, and I&apos;m so pleased to have them as part of our agency." Sheriff Capt. Jason Suydam explained that the new hires, who started in November, participated in three weeks of orientation. Eight weeks of field training followed, offering an opportunity to experience the multitude of sheriff’s duties, such as handling courthouse security, prisoner transport, fugitive apprehension, civil processing, and gun permits. The newest members of the office share a love of the outdoors with enthusiasm for the job, repeatedly listing the chance to help others and make a difference as key benefits of the position. Joel W. Buccialia, 24, a native of Newtown Square, wasn’t positive that law-enforcement would be a good fit for him when he enrolled in Delaware County Community College’s Police Academy. By the time he graduated in 2012, he was hooked and immediately enrolled in an administration of justice program, receiving an associate’s degree in 2014. While he was in school, he worked as a security officer, fueling his desire to complete his Act 120 certification. In his spare time, Buccialia is likely to be outdoors, pursuing interests that include four-wheeling, camping and hunting. Brian M. Carr, a 28-year-old who grew up in Phoenixville, graduated from Immaculata University with a criminology degree in 2014. He then attended Delaware County Community College’s Police Academy, completing the program in 2015. Carr, an Eagle Scout who was active in Valley Forge Boy Scout Troop 73, said his drive to pursue a law-enforcement career was inspired in part by his father, a U.S. Navy commander. When he’s not working, Carr said he enjoys working out and other physical activity. Mario J. Dioguardi, a 24-year-old native of Broomall, attended Penn State and then West Chester University, where he received a criminal justice degree in 2015, the first member of his family to pursue law enforcement. He graduated from Delaware County Community College’s Police Academy in 2016. A seasoned athlete, Dioguardi played ice hockey, football and baseball teams at various times in high school and college. He continues to play roller hockey and softball, and when time permits, he has enjoyed coaching baseball at his former high school. Peter S. Gardner, 26, spent his childhood in Merion and recalled being unsure of his career path when he was a junior in high school. A teacher, assessing Gardner’s demeanor and work as a volunteer firefighter, steered him into law enforcement by suggesting he would make a good U.S. marshal. Gardner went on to complete fire and police training at the Montgomery County’s Municipal Police Academy. Gardner has been active with the Philadelphia Police Explorers, a program that provides police academy-style training to members of ROTC and Boy Scouts ages 14 to 21. Off the job, Gardner spends a lot of time outdoors, riding his motorcycle or hiking in one of the county’s preserves. Christian J. Medina, a 23-year-old Coatesville native, found inspiration to become a police officer from his father, whose dream of pursuing a police career after enlisting in the Army was interrupted by parenthood. Medina said his father’s passion for law enforcement manifested itself in numerous ways, including his car choice: a used police vehicle. Medina embraced those sentiments, honored to fulfill his father’s elusive dream. Medina graduated from Delaware County Community College’s Police Academy in 2016. He counts basketball, bowling, and movies among his outside interests. CaTray D. Parker, 23, envisioned a career in law enforcement as a boy growing up in Lancaster. His extensive training includes EMT and firefighting courses at the Protective Services Academy in Lancaster County, completion of National Guard infantry training at Fort Benning, Ga., in 2014, and graduation from Delaware County Community College’s Police Academy in 2015. Parker enjoys wrestling as well as coaching wrestling and can often be found cheering at his old high school, where his little brother is on the team. He has been told to expect deployment in 2018, most likely overseas. Josue D. Pifer, 25, received career inspiration from his grandfather, who worked as a police officer in Mexico City, as well as a West Whiteland Township officer who offered periodic encouragement as Pifer grew up in Exton. After working as a roofer for several years after high school, Pifer enrolled in Delaware County Community College’s Police Academy, receiving his certification in 2014. One of his early thrills in his new post occurred when his West Whiteland mentor spotted Pifer in the Chester County Justice Center. Pifer, who is bilingual, shares his co-workers’ love for outdoor activities, especially fishing and trap shooting. 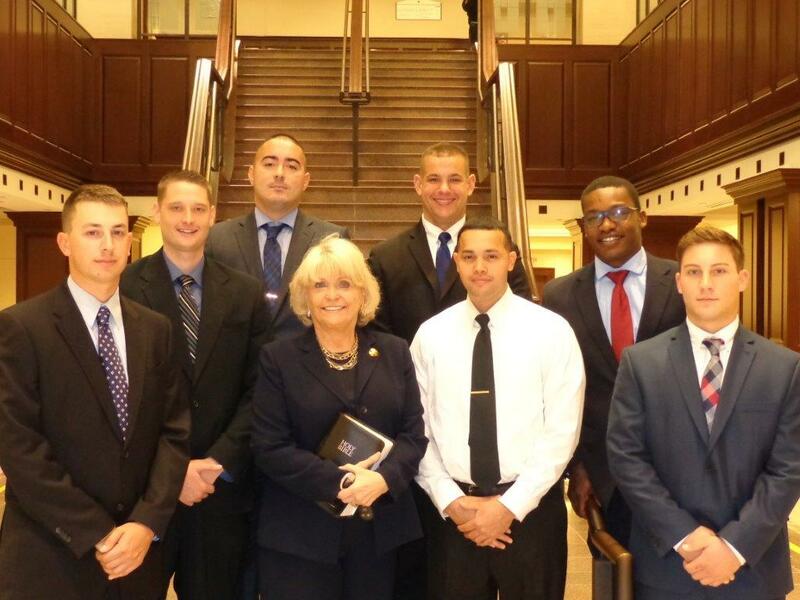 Photo caption: Joining Chester County Sheriff Carolyn &apos;Bunny&apos; Welsh (second from right ) are new deputies Peter Gardner (counterclockwise from left), Joel Buccialia, Josue Pifer, Brian Carr, CaTray Parker, Mario Dioguardi and Christian Medina.